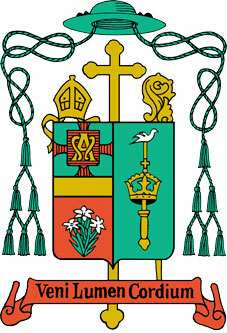 The Most Reverend Edward F. Hoban, D.D. Edward Francis Hoban was a native Chicagoan born on June 27, 1878, the son of William and Bridget O’Malley Hoban. His education was completed in Catholic schools, first at the parish grade school of St. Columbkille and then at St. Ignatius High School in Chicago. Edward Hoban then completed his philosophical and theological training at St. Mary Seminary, Baltimore, Maryland, and was ordained to the sacred priesthood at Holy Name Cathedral, Chicago, on July 11, 1903, by The Most Reverend James E. Quigley, D.D., Archbishop of Chicago. Father Hoban’s first assignment for a brief time was as the Assistant Priest at St. Agnes Parish, Chicago. He was then assigned to studies in Rome, Italy, at the Pontifical Gregorian University where by 1906 he obtained doctoral degrees in both Philosophy and Theology. Upon his return to the Archdiocese he was named the Assistant Chancellor to Monsignor Edmund Dunne, the Chancellor. That same year Father Hoban was appointed a professor at Quigley Preparatory Seminary. When Monsignor Dunne was named the Bishop of the Diocese of Peoria, Father Hoban was named Chancellor for the Archdiocese of Chicago in 1910. When Archbishop George Mundelein succeeded Archbishop Quigley in 1916, Father Hoban was reappointed Chancellor that same year and then in November 1916, Pope Benedict XV named him a Papal Chamberlain with the title of Very Reverend Monsignor. It was during Monsignor Hoban’s tenure as Chancellor for the Archdiocese of Chicago that he supervised the establishment of what was then named the Associated Catholic Charities of Chicago. Five years after Edward Hoban had been named a Papal Chamberlain, Pope Benedict XV elevated him to the rank of Auxiliary Bishop of the Archdiocese of Chicago on November 21, 1921. He was consecrated by Archbishop Mundelein at Holy Name Cathedral on December 21, 1921. For the next six-plus years Bishop Hoban served the Archdiocese faithfully in several administrative posts, including its Vicar General in 1924, and as the president of the International Eucharistic Congress in 1926. It has been noted that the acknowledged success of this Congress was due, in large part, to Bishop Hoban’s administrative skill and his manifest ability to marshal and organize the efforts of clergy, religious and laity. The Congress was the first-ever held outside of Italy and Europe, and attracted more than one million pilgrims. Bishop Hoban was installed onMay 15, 1928, by His Eminence, George Cardinal Mundelein at St. James Pro-Cathedral in Rockford. Twenty-eight other archbishops and bishops attended his installation. The Diocese of Rockford experienced honor and sadness at the promotion of Bishop Hoban as Coadjutor Bishop of Cleveland with the right of succession. His Holiness, Pope Pius XII appointed him to that office on November 16, 1942. 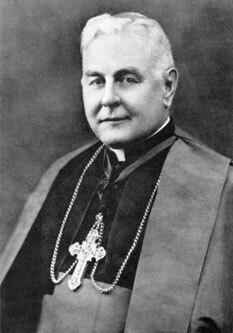 Archbishop Joseph Schrembs remained in office until his death on November 2, 1945, at which time Bishop Hoban became the Bishop of Cleveland. In July 1951, Pope Pius XII elevated Bishop Hoban to the rank of personal Archbishop. The zeal for souls and the welfare of the Church with which Bishop Hoban shepherded the Diocese of Rockford for almost 15 years, continued unabated in Cleveland until his death on September 22, 1966, at the age of 88. He spent 63 years as a priest and almost 45 years as a bishop. Edward F. Hoban, second Bishop of the Diocese of Rockford, and Archbishop-Bishop of the Diocese of Cleveland, was buried in the Cathedral of St. John the Evangelist, Cleveland, Ohio.